The wind has disappeared for a while, so it was time for some mountain biking. I took my new Trek Remedy out for its first big ride today with my buddy Dave Anderson. 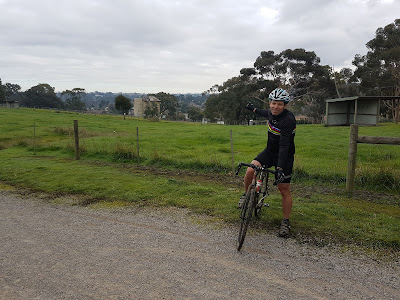 We travelled on the Anniversary trail and through Hays Paddock to get to the Main Yarra Trail then followed it out towards Westerfolds Park. A short hill climb took as to a marvellous view of Melbourne I had never seen before looking south across the Yarra to Templestowe, Bulleen and beyond. There are lots of single track loops that provide some nice riding and it wasn't too muddy. 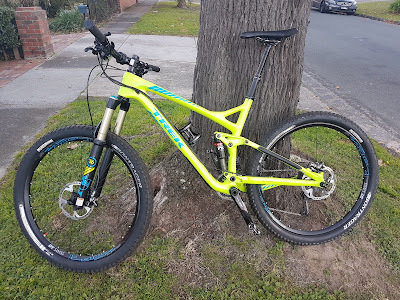 We continued on to the Mullum Mullum Creek trail and followed it south to regain the Koonung trail next to the Eastern Freeway then took some quiet roads back to Surrey Hills. All in all, a great 3 hour circuit.